Happy Bayou - Late 70's. At the age of 5 or 6, I heard my father telling my mother over and over, "Some day I'm going to take you to an island. I still thank them for having the insight and fortitude in 1952, to pack up three kids and begin a new life on a barrier island with glorious sugar white beaches, off the then story book town of Clearwater, Florida. I remember the first morning -- waking up to the sea blue horizon and calls of sea birds, thinking I was in paradise. And so, I have a special appreciation for islands, and beaches, and dreams. While at the University of Florida studying painting, etching, photography, design, and art history, I studied with many wonderful professors including the now renowned artist/photographer Jerry Uelsmann. I was privileged to be his student in both lecture and lab. Because of his great humor, kindness and creativity, I always looked forward to that class and spent a comparatively disproportionate amount of time in photo lab. At first, I was a little intimidated by the technical knowledge my classmates had previously acquired. Jerry teased in front of the class that I "held my camera upside down" ...but also assured me that getting my desired results was the most important thing. Because I was in the photo studios a lot, so was Hal. We spent time studying Jerry's photographs -- especially those which included images of nature, which he combined in the dark room, with man made elements and people. Coinciding, Hal, a landscape architecture student, was spending time out in the field, inventorying the many facets of environments as design criteria. Perhaps from this influence, Hal and I both gravitated to a way of working which includes, first, what we call "field work," and then, taking studies in the form of sketches and photographs back to our studio to ultimately create the "desired effect." The resulting image is not necessarily the one image the camera or naked eye might see at a particular moment, but a combination of images, details and effects which help to express what the Artist feels is the essence of the subject matter. Hal and I were married after I graduated from U.F. in 1966. 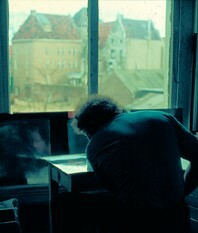 In 1971, he began painting full time. On field trips, he sketched and I used my camera. Hal and the natural elements he paints became my subject matter. He used my photos as reference for details in his work. Later, "field work" became more challenging. For instance, while sailing with our dear friends in the Exumas, we were surfing in and out of small treacherous cuts. Hal, unencumbered by equipment, was free to be a part of the crew while drinking in, with his eyes and other senses, the natural habitat he wanted to express. My role has been to get the photographs in spite of all that is going on -- more or less "shooting from the hip" -- while perhaps either staying out of the way, or quickly slipping in a shot and then grabbing a line to help. Hal's memory of his observations and sensations during these adventures, and his ability to communicate them through his paintings in layers of information, is very special. Since 1971, I have documented many landscapes -- some as they have been changed throughout the years by both the impact of man and nature. I am not under the illusion of being a great photographer -- but I have had a camera in my hands a great deal of my life, and been in the right place, at the right time, for what I desire to capture. Because of my love of art history, I became responsibly dedicated to my role of documenting the Artist, Hal Stowers. He is a most sensitive, beautiful and interesting human being. I know of no one who loves nature more. His work has expressed some of the most important aspects of our world, and it continues to evolve. He feels blessed to have been given his talent and life's work and believes that along with these gifts comes responsibility. My favorite photos are those which capture Hal in his creative moments when, because I am always "about," -- he has no clue that I have photographed him (such as the photo on the Home Page). For some time now I have been writing and editing my photos for a book. However, I feel the world wide web is a perfect way to begin to share a part of my archives to tell the story of environmental artist Hal Stowers and his message. I believe that until now, the art of Hal Stowers has been kept a (relatively) hidden treasure. U.F. Prof. Emeritus, Herrick Smith, wife Mary, Hal and B.J. and Wayne Drummond, Dean, College of Architecture, U.F. at The opening of THE GULF TO THE CARIBBEAN, Hal's retrospective exhibition at Florida's Capitol, Tallahassee. A few of the photos on the web site were generously contributed by others. I would like to thank friends and cruising buddies for their kind patience and understanding as I photographed our adventures together. I have, for the most part, not surprised our friends by unexpectedly including them on the web pages. But as time goes on... perhaps they will enjoy appearing. BDES College of Architecture & Fine Arts, UF ' 66. His first canvases were monochromatic in sepia tones. He wanted the viewer to focus solely on the natural landscape elements which were being destroyed. The landscape was presented as nostalgic vignettes. There was no sky. There were no birds. He said color and wildlife would distract from focus on the mangrove forests, salt marshes, native palm groves, sea oats and sand dunes which man was destroying at a rapid rate. 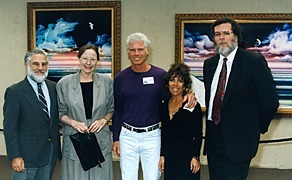 On Friday, October 15, 1971, Mr. Ed Bowen opened the doors to his gallery in downtown Clearwater, Florida, introduced the twenty-seven year old landscape architect/environmental artist, and sold all twenty-two canvases in the solo exhibition. People crowded into the gallery to see this art which captured the essence of surrounding natural areas they loved. The next two exhibitions, each six months apart, were also jammed with people and sold out. In a world in which the artist was expected, more and more, to become an entrepreneur, it was almost a dream to be discovered early on by dealer Ed Bowen, a retired executive from U.S. Steel. It was a reciprocal dream for Ed Bowen who had just opened his gallery in then very small downtown Clearwater, to chart the course for this dynamic young artist. But their close friendship of only eighteen months, and probably an era, ended with Ed's stroke and passing away a few weeks after the third exhibition. During his last days he mapped out for us his plans, policies and dreams for Hal's future. Devastated by this loss, we packed a few things and our life's savings of around a thousand dollars, and left for Europe to get our thoughts together. For two months we slept on the floor, lived, worked, and partied with Dutch artists in their private ateliers, studying etching and lithography, and enjoyed being young together in Paris. Hal returned home with his first hand pulled etching/aquatint edition, "Today, Tomorrow too?" We moved to a rented home, off the beaten path in Crystal Beach, invited our collectors to see the new work and were thankful to find we could survive on our own. It was becoming a world in which it was no longer necessary for an artist to emanate from Paris or New York, or even Santa Fe. Hal struggled but continued to thrive from his home base in Florida. His collectors loved and needed his art almost as much as he needed to create it. There was never a doubt that this was meant to be his life's work. Then, and still now, Hal says it is a miracle every time he sells a piece of work. He has known both the agony and ecstasy of being an artist. helped to make possible the body of works I have created." Gradually, a few laws were passed which began to protect Florida's natural habitats. Near his home, pristine barrier islands became a part of the state park system. In 1974, we somehow managed to build and move into our two story studio/residence, on a bayou off the Intracoastal Waterway, in tiny and charming Crystal Beach. We named it Happy Bayou, put in a vegetable garden, started the compost, and caught fish and crabs to eat (and still do). The first work Hal created in his new etching studio was his individual Bicentennial project, a suite of six etching/aquatints entitled "Soliloquies to Disappearing Fragilities." From his high perch, Hal became concerned with the pollution he began to observe. He added color to his work to express the clear skies and crystalline sunsets we had experienced since childhood, which were now also threatened. With more development and loss of habitat, we saw fewer of certain birds, such as the endangered roseate spoonbill. He began to include birds in his paintings. There was pending legislation regarding drilling for oil. The clear water and uninterrupted horizon of the Gulf became increasingly important for him to paint. a zinc plate in a Dutch friend's atelier. "Sky Mountains" Series at Topaz Editions. The more simple lifestyle of Florida in the Seventies and early Eighties is reflected in Hal's early works with clear skies and a "less is more," overall minimal statement. As development continued to cut more paths, the sounds of nature and silence were often overcome with that of traffic. Life and survival seemed to become more complicated. With the help of his long time collaborator and friend, Master Printer, Julio Juristo, Hal found a new medium to express his feelings and his work took somewhat of a sea change. "Monotypes" set him free to explore new impressions. He literally would jump up onto the master plate atop the large litho press, and used whatever tools and techniques that were convenient, especially finger painting, in the viscous oil based ink. He loved the direct physical involvement and act of blending colors right on the plate. It proved to be the perfect medium for him to express his "sky mountains," Hal's term for Florida's beautiful and ever changing cloud formations. Reflecting a necessity to deal with a more complex world, the new works include more information and there are many more marks on the paper. The high energy images may result from the impact of man, but as a counterpoint, express the beauty and forces of nature in a most passionate way. The monotypes serve as "under paintings." He adds various elements in layers with watercolor and acrylic. The strong horizon continues to bring balance and order. The end result is a refreshing relief opposite that of the chaotic urban environment. 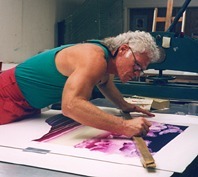 His experience with the monotype process permeates his canvases, watercolors, lithographs and etchings created after 1985. Experiences on board MANGROVE MOMMA IV, our 36' trawler which served as a floating studio along Florida's coast during the years 1984-86, had also added richly to his vocabulary of images and intensified his desire to express respect for the "forces" of Mother Nature. Hal loves to paint, dance and exercise... sometimes all at once ... to the Blues! Hal Stowers is constantly concerned with communicating with others on many levels. To get his messages across, be they purely aesthetic, ecological, documentation of areas to be preserved, or spiritual, he uses a variety of methods and implements, including brushes, sponges, pencils, air brush, and his fingers. He listens to music and dances as he paints. In a quote to accompany the commemorative art for the First Tampa Bay Blues Festival in 1995, he explains, "I seek to capture the rhythms, balance, energy, color and pristine qualities in nature. Listening to the Blues as I paint helps me translate my heartfelt sensations into the art form. With regards to basic elements, Nature and the Blues have a lot in common." In addition to the Blues, he paints to rock, soul and reggae. It was 1975 when he first heard the voice and tropical reggae rhythms of Bob Marley, originating from the neighboring island of Jamaica. During the next two decades while cruising the waters of Florida and the Caribbean, and while creating in the studio, Marley's reggae music, incorporating elements from rock, soul and blues, set the mood for Hal to explore the sensual qualities of his tropical environment. Although he has a sense of art history, and favorite Old Masters, he is not concerned with whether his art is considered to be impressionistic, realistic, abstract, minimal or any other label. Just as nature is constantly in flux and evolving, so is his imagery. It is important to consider the entire body of his work as a whole to see how each medium and period reveals different qualities and aspects of our natural world. Regarding the changes and various periods in his art, he says even he doesn't totally understand -- it "just happens -- that in creating his art he has "a lot of Help." He's very thankful that this is his life's work. Hal says he wants others to love nature as much as he does -- to observe it, love it, and interact with it -- all the while treading lightly." His creative flow requires large doses of nature on an everyday basis. In becoming familiar with new locations, he spends time "just being there" -- soaking up the local color. He likes to talk to the locals of the area about their environment and special concerns. What he refers to as "field work" often involves studying a particular habitat or site over a period of days, from sunrise to sunset, and in different weather conditions. He paints natural processes involving elements of water, sky, earth, growing, living things and that which has ceased to live. As he paints, he says he "becomes" whatever he is painting, be it water, shifting sand or a sea grape leaf. A sand dune is a sea of white which may be coming or going defined only by an edge of water or sky and a few shadows. The tide and sky seem also to be in transition, the sun captured at a moment of its setting. Sea oats and sea grasses gracefully and rhythmically slice through sky and water, or struggle to survive, appearing and disappearing as they crawl along, sculpting the sand. Often a single shell, placed and painted in an enticing way says "pick me up" to the viewer. The horizon line is always level and provides stability to what is sometimes a subtle, or very strong, "blending" of colors and action in the form of lines or color areas. The edges of the work are important. White paper may serve as foreground, if the viewer so chooses. Often, airbrushed passages will make the very edge of the work shimmer. He loves to "play" with light and takes liberty with its source and direction. His paintings provide an aesthetic experience similar to being surrounded by nature, with just enough "Super Real" details to help the viewer enter. In a spiritual sense, they provide access to a world in a pristine state, at a pristine moment. He describes experiencing certain moments in nature as "moments of heaven on earth." This "pristine moment" is, for many of his collectors, an important and soothing relief and contrast to the urban environment. They say it is like a tonic. His art is a bridge, bringing back to memory places and sensations they have experienced. They like to surround themselves with his images. The art helps them express to others their own sensitivity, feelings, appreciation and regard for the natural environment. They say it helps them see in nature things they have never seen before. His collectors will frequently discuss with him, or amongst themselves, a "Hal Stowers Sunset" they have recently experienced. Hal wants his art to lift people's spirits. He also hopes that living with his art will help them on an every day basis in making sensitive decisions which affect our fragile natural environment. the rhythm of succession. . .
realizing the serious impact of his value judgments." Hal and B.J. 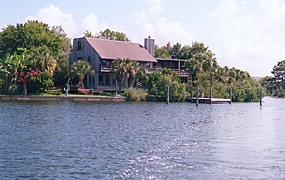 Stowers' studio and home base in Florida -- off the beaten path, amongst the mangrove at Happy Bayou on the Gulf of Mexico. A daily source of inspiration. In the spring of 1995, Hal's dear friend and Master Printer Julio Juristo, passed away after nineteen years of their wonderfully creative collaboration. Donald Saff, founding director of the Graphic studio at the University of South Florida at Tampa, had introduced Hal to Julio in 1976. A Tamarind Institute Master Printer, Julio had been a part of the USF Graphic studio before opening his own private studio. Hal continues now, to collaborate with Master Printer Robert Townsend in Boston, and recently created a photogravure with the assistance of expert Jon Goodman, also of Massachusetts. He is always excited about opening new doors and embraces new technology in his creative work and communication efforts. a joining together of all the arts, disciplines . . . individuals, corporations, countries... with focus on caring for our global environment." Following this exhibit, he expressed concern for the Bahama Islands which were beginning to experience rapid and often insensitive development similar to Florida's. His 1991 exhibition entitled, "HAL STOWERS, WORLD ENVIRONMENTAL ART, 'THE BAHAMIAN GAP - EXOTIC MOODS & ADVENTURES,'" benefited The Nature Conservancy, and The Exumas Land and Sea Park in the Bahamas. His "FLORIDA - TWO DECADES," exhibition in Orlando, and "THE GULF TO THE CARIBBEAN," exhibition at Florida's state Capitol in Tallahassee, 1993, demonstrate further his efforts to reach out. From 1996 to 1998, Hal's field work included COLORADO, COSTA RICA, MAINE, JAMAICA and FLORIDA, resulting in exciting new works focusing on the natural essence of all these locations. In his new FREE AGAIN! Series, for the first time, "fish surfaced" in the natural habitats he has been expressing. In 1997 he decided to dive into the digital world -- allowing him more control over his images in all circumstances. With state of the art equipment, he finds it an exciting medium and is remarkably and masterfully combining digital aspects with his traditional methods in creating some of his images. The year 1999 marks the opening of Walking Tree Inc.'s Hal Stowers World Environmental Art web site (www.halstowers.com). Hal Stowers' art continues to evolve, as he fulfills his role as an important artist of the new Millennium. SPECIAL THANKS: To our friends/collectors for their support and kind referrals over the years, and to all of our family & friends for their understanding and love. Web page, Contents, Photographs & Art Copyright 1998 by Hal & B.J. Stowers. All rights reserved. Page modified 01/20/99 by WALKING TREE, INC.